Western blot analysis of p70S6K expression in HeLa cell lysate using preservative free Mouse anti Human p70S6K: (MCA3430Z). 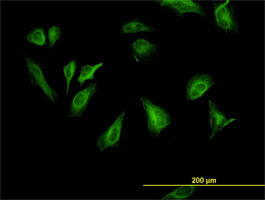 Immunofluorescence showing p70S6K in HeLa cells using preservative free Mouse anti Human p70S6K (MCA3430Z). 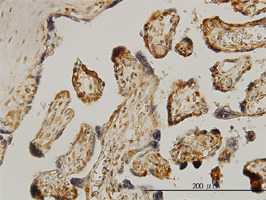 Staining of paraffin embedded human placenta with preservative free Mouse anti Human p70S6K:(MCA3430Z). Western blot analysis of MCF-7 human breast adenocarcinoma whole cell lysate probed with Mouse anti Human p70S6K antibody (MCA3430Z) followed by HRP conjugated Goat anti Mouse IgG, visualized by chemiluminescence. Mouse anti Human p70S6K antibody, clone 1E12 recognizes human p70S6K, also known as Ribosomal protein S6 kinase beta-1, 70 kDa ribosomal protein S6 kinase 1, Ribosomal protein S6 kinase I, Serine/threonine-protein kinase 14A or p70 ribosomal S6 kinase alpha. p70S6K is a 525 amino acid ~70 kDa Serine/threonine-protein kinase acting to promote cell division and survival through inhibition of pro-apoptotic activity of (BAD). Recombinant protein corresponding to aa 416 - 526 of human p70S6K encoded by gene RPS6KB1. Spleen cells from BALB/c mice were fused with cells from the Sp2/0 myeloma cell line. Bodnar, L. et al. (2015) Clinical usefulness of PI3K/Akt/mTOR genotyping in companion with other clinical variables in metastatic renal cell carcinoma patients treated with everolimus in the second and subsequent lines. Ann Oncol. 26 (7): 1385-9.